Oak Ridge National Laboratory researchers at the Carbon Fiber Technology Facility have demonstrated a production method that dramatically reduces the cost and energy required to produce carbon fiber. OAK RIDGE, Tenn., March 22, 2016 – Researchers at the Department of Energy’s Oak Ridge National Laboratory have demonstrated a production method they estimate will reduce the cost of carbon fiber as much as 50 percent and the energy used in its production by more than 60 percent. After extensive analysis and successful prototyping by industrial partners, ORNL is making the new method available for licensing. High cost has been the single largest roadblock to widespread use of carbon fiber as a strong, stiff reinforcement for advanced composites. ORNL’s new lower cost method, demonstrated at its Carbon Fiber Technology Facility, builds on more than a decade of research in the area. The researchers’ success promises to accelerate adoption of carbon fiber composites in high-volume industrial applications including automobiles, wind turbines, compressed gas storage and building infrastructure. More than 90 percent of the energy needed to manufacture these advanced composites is consumed in manufacturing the carbon fiber itself. Reduction in energy consumption in manufacturing will enable earlier net energy payback—that is, the energy savings gained in using products made from lighter-weight material compared to the energy consumed in making the material. Similarly, ORNL is working as a technology partner in IACMI – The Composites Institute – to enable the use of low-cost carbon fiber composites in a wide range of next-generation clean energy products, from offshore wind turbines that lower the cost of electricity to high pressure tanks for the storage of natural gas. A detailed analysis compared the new process to a published baseline for conventional carbon fiber production. Cost factors were considered for nine major process steps, starting with the precursor and pretreatment and finishing with surface treatment, sizing, winding, inspection and shipping. Carbon fiber is produced by converting a carbon-containing polymer precursor fiber to pure carbon fiber through a carefully controlled series of heating and stretching steps. In current commercial practice, the precursor – polyacrylonitrile, or PAN – is chemically modified and optimized to maximize the mechanical properties of the end product. The high cost of specialty precursor materials and the energy and capital-intensive nature of the conversion process are the principal contributors to the high cost of the end product. Acrylic fiber of similar chemistry, however, is produced on a commodity basis for clothing and carpets – a high-volume product that costs roughly half as much as the specialty PAN used in the carbon fiber industry. ORNL researchers believed textile-grade PAN was a pathway to lower-cost carbon fiber, but laboratory-scale experiments couldn’t fully explore its potential at a production scale. To provide that capability, DOE’s Advanced Manufacturing and Vehicle Technologies offices have funded research and operations at ORNL’s Carbon Fiber Technology Facility, a highly instrumented, semi-production scale carbon fiber conversion plant. Extensive mechanical property tests have been performed on carbon fiber from the new process, and several auto manufacturers and their suppliers received quantities suitable for prototyping, with encouraging results. “Our R&D into process improvements and the extensive validation work at the Carbon Fiber Technology Facility provide manufacturers and end-use industries the confidence needed to invest in large-scale manufacturing, knowing there will be a market for this material,” said Gary Jacobs, ORNL’s interim associate lab director for Energy and Environmental Sciences. Companies, including licensees of the new method, will be able to use the Carbon Fiber Technology Facility to refine and validate carbon fiber manufacturing processes. The facility was dedicated March 26, 2013, by Assistant Energy Secretary David Danielson and Tennessee Gov. Bill Haslam. 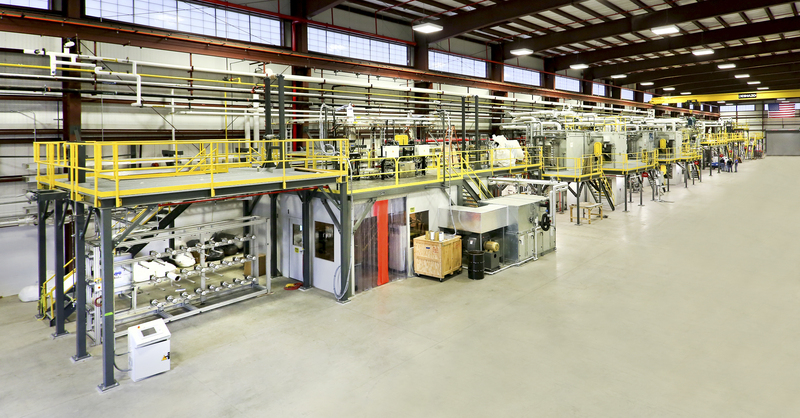 ORNL will accept license applications for this low-cost carbon fiber process through May 15. Licensing information for manufacturers in the U.S. is available at https://www.fbo.gov/index?s=opportunity&mode=form&id=8d64c7f283bf456731ea8be211861ddd&tab=core&_cview=0. The Carbon Fiber Technology Facility is supported by DOE’s Office of Energy Efficiency and Renewable Energy’s Advanced Manufacturing Office (AMO) and the Vehicle Technologies Office (VTO). AMO supports applied research, development and demonstration of new materials and processes for energy efficiency in manufacturing as well as platform technologies for the manufacturing of clean energy products. AMO also provides support for ORNL’s Manufacturing Demonstration Facility, a public-private partnership to engage industry with national labs. VTO established the Carbon Fiber Technology Facility under the Recovery Act and supports its operations as well as research and development of a broad range of lightweight materials technologies to reduce vehicle weight and improve fuel economy.